Recently, I read an article written by a mother coping with the grief of her teenage son’s death. The article was a poignant account of how she was having difficulty going in her son’s room now that he was gone and the last moments of his life as a heroin-addicted drug user. The article included a picture of her handsome son in his hockey uniform. Nothing about his demeanor or face suggested he was anything but a happy, healthy adolescent — yet, the last moments of his life were spent vomiting while his mother screamed helplessly as EMT’s worked to stabilize him. The mother’s words literally bled from the page as she shared her honest struggle navigating life without her boy. The mother’s words stayed with me in a haunting way after I put her article down. After reading her account, I couldn’t help but think of my own children, and I felt a sense of fear myself. I began to think about how fragile life is. I began to irrationally worry for them. They were heading out for an outing at the swimming pool with my husband, and I could feel a frenzy of anxious thoughts stir. I was worried for their safety in the water that day. For their safety in the van while they were en route to the pool. For their safety every day. I exhaled a little more and let the truth of her statement wash over me. We live in a world where things go terribly wrong. People get hurt. Parents lose children. Relationships get broken. Being a mother, I feel a tremendous sense of love for my children. And with that love comes fear — because I know I can’t protect them from everything. In 2 Timothy 1:7, we see a young minister of the Gospel struggling with timidity not in his role as a parent, but in his role as a minister. Paul exhorts him with these words: “We have not been given a spirit of fear, but of power and of love and of a sound mind” (NKJV). Though these words were given by Paul to strengthen and encourage Timothy in his ministry, as commentator Charles Ellicott states, these words can be taken in a more general sense, as applicable to all Christians. The verse assures us that we as Christians have been given the exact opposite of fear: “power … love and … a sound mind.” That is — we don’t have to accept fear when it comes because it is not from God, and we have the means with which to resist it and send it packing. I understand because I have been in similar positions, as in the scenario I described with the frightening article, and I continue to have bouts of fear. Quite frustratingly, I have dealt with more fear as I’ve pressed into God these past few years — not because God has sent it to me, but because as I’ve become a more potent weapon for his kingdom, the attack against me has become very strong and very real. There are days when the fear has been so thick that it is palpable, and I feel immobilized. But Paul assures Timothy and Christians that we don’t have to remain in that place of feeling overcome. The “power” mentioned in the verse that we have at our disposal is the power that rests in us because of the Holy Spirit. This power we are given helps us discern and identify when wrong thoughts or ideas come against us — whether this be through Satan trying to plant these thoughts directly or through Satan working through the actions or words of people. The “love and sound mind” part of the verse suggests that this counsel we have is such that we can reprove others in love when they offer ideas that counter God’s Word and walk in peace and stability of thinking, not only for our own sake, but the sake of others. We make ourselves easy prey when we don’t make time daily to pray and spend time in God’s presence. God assures us that His peace guards our hearts and minds (Philippians 4:7). Sometimes, right in the moment when I pray I feel instantly at peace and my fear dissipates (as in this instance). Other times, when the fear is so strong, I will get a verse later through a friend or family member, a line in a sermon, or by some other means. That verse will be one that I can cling to that acts as a stabilizing force for my mind. As believers, we should expect that God will come to our aid, and we can call out for this rescue during prayer (Psalm 31:2). In my most recent situation fretting over my children, before I prayed about it, I had this thought: “Praying isn’t going to do anything.” And that was a lie straight from the enemy! I pressed through and prayed anyway and felt better. And it was just a little later in the day that I came across Baker’s devotional which further encouraged me and helped me get over the anxious thoughts I was having. 2). Take every thought captive. The power of the Holy Spirit Paul speaks of helps us to take every thought captive that is not of God. We can know when a thought or idea is going to derail us; instead of accepting that idea, we can keep our mind clear and at rest by resisting wrong thoughts. She concludes her devotion by emphasizing that there is nothing “more powerful than our hearts hearing our lips proclaim our trust in God’s truth” — truth that not only children but adults can find assurance in. What do you believe about fear? Both prayer and right thinking help us to meditate on God instead of the scary person or circumstance — but it also boils down to belief. We have to believe that God doesn’t want us to fear and trust that He will help us. Unfortunately, some of us embrace fear and hold onto those worrisome thoughts that come our way because we don’t believe that there is the power available to us to overcome it. We accept it thinking there is no other choice, but Scripture indicates that God has a better way for us. In addition, many of us beat ourselves up for having the fear at all. 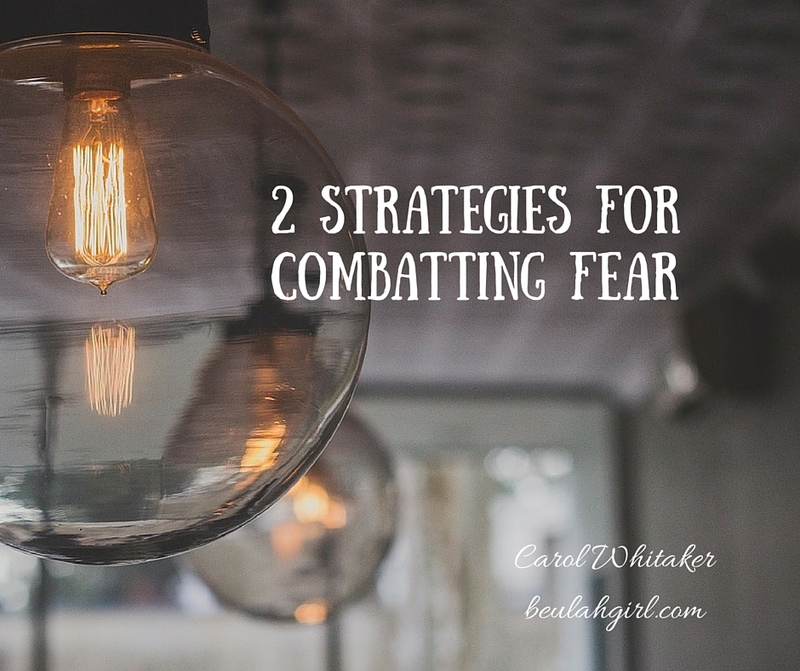 Rather than do any of those things, we must realize that God does not intend for us to cower down to fear or feel down that we are feeling so timid. Instead, He wants us to look to Him and know in the depths of our being that He is bigger than anything we face. Join us for a live Blab chat Monday, April 11 @9 or watch the replay.